Honeywell's LYNX Touch 7000 all-in-one business and home alarm system was just revealed at the Vegas 2014 ISC West Security Show on April 2, 2014. Our President Paul Seidman personally experienced first hand the new features of the Honeywell Industry leading security manufacture latest product Line up for 2014. 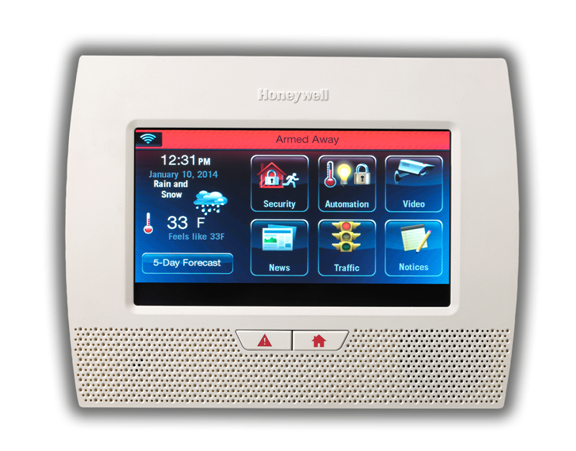 The Honeywell LYNX Touch 7000 is amongst the newest security systems unveiled by Honeywell in Vegas on April 2, 2014. Adding to the reliable Honywell security systems, the well-known LYNX 5100. The LYNX Touch 7000 features a bright 7" full-color touch screen with graphic icons and intuitive prompts for easy operation. It features on-screen video, Z-Wave automation capabilities, advanced alarm communications, garage door notifications of when your doors are open and full control so you are able to close them. You can display up to 4 Video cameras individually or in a quad mode configuration on the 7" touch screen display showing 16.7 Million colours at 800 X 480 Resolution. The LYNX Touch 7000 has the ability to be monitored over WIFI or GSM and completely eliminates the use of standard POTS Line which are standard telephone communication and truly lack secured transmission in the event of an intrusion and are no longer considered a way to provide reliable security services in Toronto. The LYNX Touch 7000 now offers Two-way voice via Wi-Fi module offering the lowest cost alarm communications yet for our customers. Honeywell's LYNX Connect app's available from iTunes or Google play provides our customers with the ability to use an IOS or Android devices to view video and operate the alarm system from anywhere in the world via internet access. The LYNX Touch 7000 proudly offers dual pathways for additional high end homes that want backup security typically not available from all security providers. Designed totally with the end-user in mind the LYNX 7000 is simple to program and configure making the Honeywell LYNX Touch 7000 the best security system ever made by Honeywell. It is capable of monitoring 80 programmable wireless intrusion zones plus 24 dedicated keyfob zones, making this a security system capable of doing almost anything in your home. The unit is a full-featured system with Honeywell's legacy in mind, continuing the company's commitment to Z-Wave technology. With the simple addition of the LYNX Touch 7000 Z-wave module, this unit can easily be made the brains of your home, controlling both your security system and satisfying your home automation needs and making your home safe and fun to be in. Let us configure your LYNX Touch so you can control your complete security system from anywhere in the world. It features on-screen video, Z-Wave automation capacities, including advance alarm communications, garage door notification and control including tornado alerts for U.S.. and Canadian residents. The New LYNX Touch 7000 is flash upgrade able so you never left with security that can't move forward when you need to upgrade the software.. Whether using the new LYNX Touch 7000 as backup or primary communications, the advanced 4G radio improves longevity and maximizes your security for your home and business around the clock. Pre-Lock Security Services can install wired, wireless or hybrid alarms systems mixing physical wires where possible with high tech wireless security equipment by Honeywell. We can even take over or upgrade your existing alarm system to meet the ever changing needs of your family and home. Protecting your self from burglary has never been easier before. Let us configure your alarm system to include door sensors, window sensors, motion detectors, glass break sensors and more. Add monitored detectors for smoke, carbon monoxide, flood, sump pump overflow and temperature changes.